Gail grew up on the sunny beaches of the south shore of Long Island. Her love of the rustling forest of the South Mountains and the deep history of the region brought her to South Central Pennsylvania full time in 1994. Gail is a licensed Realtor, and the Owner of Time Travelers Estate Sales, a Pennsylvania licensed full service auction company specializing in real estate, antiques and personal property. Gail understands that excellent client services stem from a long professional business background. She takes great satisfaction from being able to provide her clients with professional auction services knowing that the time it takes to sell property today has increased dramatically, and her role as both a Realtor and the Head of the Realty Auction Division of EXIT PREFERRED REALTY enables her to offer her clients the viable option of selling residential and commercial real estate quickly and effectively at auction. Gail also enjoys working with those relocating to the Franklin County area. She specializes in Senior Citizen transitioning and downsizing, she understands that moving can be an arduous process, both physically and emotionally, and she can be counted on to be there every step of the way with a clear plan and a caring positive attitude. The Chambersburg area offers dynamic opportunities for Senior Living, and the Cumberland Valley has a wonderful quality of life for those of all ages. Gail was trained in the interpretation of American History in the National Park Service and had a 20 year career in a large public museum system. Owning an auction company and retail antique business has allowed her to hone her professional skills. She has served on a Municipal Architectural Landmark Preservation Commission Board and on several Historical Society Committees. Gail was nominated to Who's Who in American Women in 2009 as an independent scholar in her field of expertise, Historical and Period Clothing. Her hobbies include collecting minerals, shells, fossils and meteorites. Gail's husband say she collects shoes too, to which she replies "A gal can never have too many shoes." Studying Theoretical Physics and Psychometry are also of great interest to her. One of the many creative outlets that she enjoys is Scherenschnitte, the Pennsylvania Dutch Art of Paper Cutting. Gail and her husband adopted their Daughter from Russia in 1995, and today they continue to mentor and sponsor couples in the International adoption process. She also believes that it is important to be of service in her community, and she holds clothing drives to raise money for local charities. 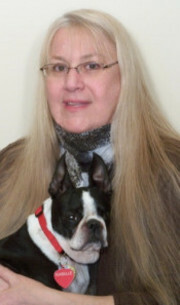 Puppy mill rescue is dear to Gail's heart, and she is pictured here with her beloved Boston Terrier rescue Isabelle. Gail is a member of the Pennsylvania Association of Realtors, the Penn-Mar Regional Association of Realtors, the National Association of Realtors, the Pennsylvania Auctioneers Association, the National Association of Estate Sales Coordinators and Liquidators, the Antiques & Collectibles National Association, the Costume Society of America, and the Vintage Fashion Guild. Gail is a dependable Realtor who is eager and committed to achieving her clients' goals, and who is always personally striving to be the best person that she can possibly be.